Non-Union refers to the situation when, after a bone is broken, the bodys attempts to heal the bone have failed, leaving the two bone ends un-united, or in a state of 'Non-Union. There are many reasons why this can happen and it is important to identify these reasons if treatment of a bone non-union is to be successful. Not all non-unions require treatment, but if the non-union leads to symptoms of pain, weakness or loss of function, treatment to help the non-union heal can relieve or improve these symptoms. Treatments for bone non-union centre around two principles - mechanical stability of the bone and improving the local health of the bone. This can involve treatments from the simple application of plaster casts, to the use of plates, screws and metal rods on the inside of the body, or the use of external cages (fixators) on the outside of the body. 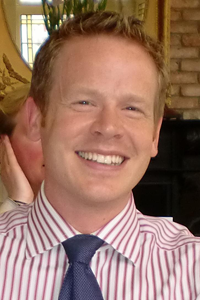 Many non-unions can be treated without the need for 'bone grafting' but not all. Bone grafting involves either moving bone from one part of the patient's body to another to stimulate healing, or the use of artificial bone substances. All of these methods have their indications and limitations based upon the type of non-union and the patient and must be thoroughly discussed before embarking upon surgery. Mal-union means that a bone has healed, but has healed in a position which is different to before it was broken. Many bones are very tolerant of mal-union and will not lead to pain or problems with day-to-day function, the humerus (upper arm bone) being an excellent example. However, mal-union can cause problems in several ways. Mal-union of the forearm bones restricts the ability to turn the hand around. Mal-union of the bones in the leg (femur or tibia) can lead to loss of rotational movements, a change in the length of the legs, or overloading of the knee and ankle joints if the mal-union changes the way the joints carry the bodys weight, possibly leading to arthritis. Re-breaking the bone to restore its original shape can lead to restored function, improved pain and reduced risk of arthritis. This can be achieved in many ways, determined by the location of the mal-union, what correction is required, and what the patients wishes are. External fixation is a technique that uses a cage or bar (e.g. an 'Ilizarov' or 'Taylor-Spatial Frame') on the outside of the body, connected to the bone by strong wires or screws. This allows, for example, broken bones to be held together without large metal implants on the inside of the body, and avoids large cuts in the skin. Also, by changing the shape of the cage on the outside of the body, the shape of the bone on the inside of the body can be changed. This allows mis-shapen bones to be straightened, short bones to be lengthened and stiff joints to be moved. Because the shape of bones is changed only very slowly, the body tolerates the changes very well, and allows new bone to be grown and stretched - a technique employed in limb lengthening surgery. 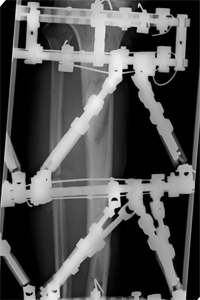 The correct and safe use of external fixation is technically demanding for both surgeon and patient and requires a high degree of patient co-operation and care to look after the fixator. The length of time a fixator is in place varies depending on what it is used for, but would rarely be less than 3 months and occasionally might be for up to 12 months for complex problems. During this time, the patient has responsibility for looking after the day-to-day care of the fixator, with appropriate education from the surgeon! 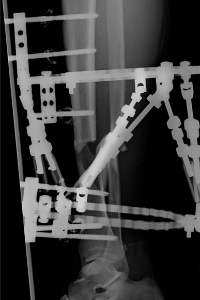 External fixation is the only option for certain conditions and when used correctly can yield quite incredible results. Internal fixation refers to the use of metal implants that are placed under the skin to hold bone in position while it heals. These usually take the form of plates and screws attached to the outer surface of the bone or metal rods (intramedullary nails) placed down the middle of bones. The advantage of these methods is that all the metalwork is contained under the skin so it is much easier for a patient to carry on with a more normal life. In certain cases, internal fixation can be performed 'percutaneously', akin to 'keyhole surgery' where the scars on the skin are minimised. It is not usually necessary to remove the metalwork once the bone has healed, unless it is causes problems for a patient, usually by being prominent under the skin. Sometimes peoples occupations or hobbies might also affect the decision to remove metalwork. The disadvantages of internal fixation can be large metal implants that cause discomfort, the possible need for removal at a later stage and, with internal fixation, once surgery is complete no further adjustments can be made. Hip replacement is extremely successful in eliminating pain caused by arthritis and restoring function that has been lost secondary to pain and stiffness in the hip. The surgery involves removing the worn out ball of the hip joint, and clearing out the worn out socket, before inserting a new ball and socket joint. As a general rule, a patient should expect to have virtually complete relief of pain, if of course their pain was originating from the hip joint. Sometime people may have pain that they feel in and around the hip which actually is caused by problems elsewhere such as in the spine, and it is very important to make sure the source of somebody's pain has been accurately diagnosed. Despite hip replacement surgery being commonplace and very successful, it is still a considerable operation that carries with it some significant risks both from the surgery itself and also after the surgery. It is therefore essential that a patient has a full discussion of the risks and benefits with their surgeon before undergoing surgery. It should always be borne in mind that a hip replacement is nothing more than a mechanical bearing, and as with any bearing surface, they can wear out. There are many different types of hip replacement and different types of bearing surface, and a patient should expect to be able to have the reasons for choosing a specific type of hip replacement explained to them by their surgeon. Again, total knee replacement surgery is commonplace and very successful, although not as successful as hip replacement surgery. The purpose of knee replacement surgery is to relieve pain and therefore improve a patients quality of life. However, total knee replacements often do not relieve all of a patients pain, relieving perhaps 80-85%. The amount of movement in a total knee replacement is related to the amount of movement in the patients knee before surgery. Therefore, if a knee is 'stiff' before a knee replacement, it is likely to be stiff after surgery as well. A knee replacement should therefore not be thought of as giving somebody a 'normal knee'. As a general rule, it is about 3 months before patients are becoming happy with a total knee replacement, but patients will continue to see improvement for up to 18 months post-operatively, during which time the knee will remain slightly swollen and warm. Total knee replacements are a considerable operation for the body to undergo, and therefore, like hip replacements, carry with them some considerable risks. It is imperative that patients have realistic expectations as to what might be achieved with replacement surgery which can only be achieved with a full discussion with their surgeon. Patients with unrealistic expectations do very badly with total knee replacement surgery.